Whether you are new to crochet or just want a refresher, this is the first in my Getting Started with Crochet series. A crochet hook and some yarn is all it takes to get started in crochet, making it one of the least expensive needlework crafts there is. I absolutely love to crochet. Give me a hook and some yarn and I’m in heaven. I crochet when I’m happy. I crochet when I’m sad. When I’m worried, the rhythmic movement soothes my soul. It’s both relaxing and immensely satisfying. First things first. You need a hook. Surprisingly there are a lot of choices, some more readily available than others. The most common hooks are aluminum/metal, steel, wooden and plastic. Some hooks have ergonomic plastic handles and there are specialty hooks for Tunisian crochet and Broomstick lace. I primarily use Aluminum hooks. Boye brand is my favorite, but there are others that work just as well. Steel hooks are used for fine work, such as when crocheting lace and doilies. The other varieties are for yarn. The best hook for you is the one that is most comfortable, so try metal, wood and plastic or even an ergonomic handled hook to see what you like best. The hook tip is the business end of the hook. It is what slides in and out of your stitches and will grab and hook the yarn through the work. Different brands will have different shaped hooks, but they all work the same. The throat is the slanted part of the hook. The yarn loop pulls from the hook to the shank. The shank is the most important part of the hook. This is a straight area where the stitches are formed to their final size. Stitches should be worked on this area. If you work them on the throat area instead, they will be too small. 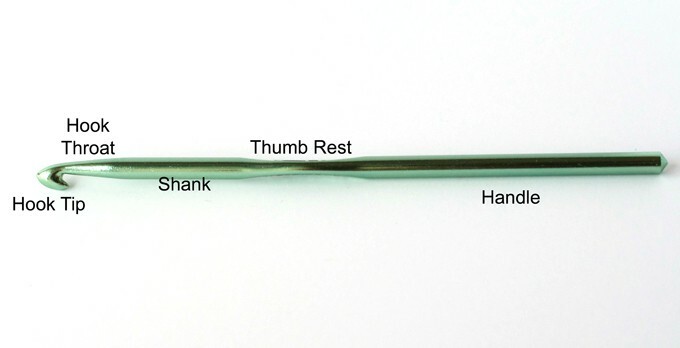 The thumb rest is an indented area on some hooks which is a nice place to help with your grip or to place your thumb. Some brands will put the hook size here. Other hooks don’t have this spot at all, such as the wooden Brittany hook in the first picture. The handle or shaft is where the hand rests as you work. Hooks come in many sizes and to make things really interesting, different countries use different numbering systems. Here in the U.S. we use a lettering system, but manufacturers will typically list the metric equivalent as well. There is a handy chart here (and also in our Resources section). The pattern design will state the size hook used by the designer. There are two ways to hold a hook: The Pencil Position and the Knife Position. To hold the hook in the Pencil Position, grip it as you would a pencil. If the hook has thumb rest, position it above your thumb and under your index finger. To hold the hook in the Knife Position, hold the hook as you would if holding a table knife to cut food. If the hook has a thumb rest, your thumb and index finger will settle into this spot. It’s important that you maintain a bit of tension on the yarn as you are crocheting so that your stitches turn out even. To do this, weave the yarn in between the fingers of your left hand. With the crochet hook in between my two hands, the yarn to the skein will flow over my left index finger, under the middle finger, over the ring finger and under the baby finger. Other crocheters will do a little wrap around the baby finger or weave the yarn around their fingers slightly differently. You will find the best way that works for you. These are just suggestions showing the most common hook and yarn holding positions. There is no one “right” way. If you hold your hook and yarn a completely different way, that is ok. The important thing is to form nice, even stitches and to enjoy crocheting! Next up in the series we’ll go over slip stitches, chaining and how to finish off your work! There are actually many more ways to hold a hook and also many more types of hooks. It’s amazing, isn’t it? 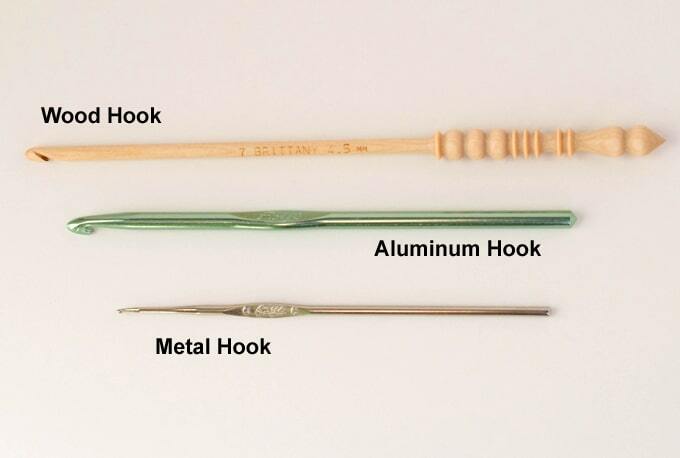 As I mentioned, crochet hooks are made out of many different types of material. The photos show those that are most readily available to today’s crocheter and the ones in my own collection. As far as holding a hook goes, it’s all about achieving nice even stitches. These two hand-holds are the most common and good ones for beginners. But by all means, if your hand hold is different and you’re getting great stitches, that’s the perfect position for you! Thank you Cheryl! I always thought I held my hook wrong but couldn’t learn the way I saw everyone else holding it. Habit I guess. I appreciate you! I’ve actually only been crocheting a lot for the last 2 years but I love it! I think the most important thing is to hold your hook in a way that is comfortable to you that allows you get achieve even stitches and pattern gauge. 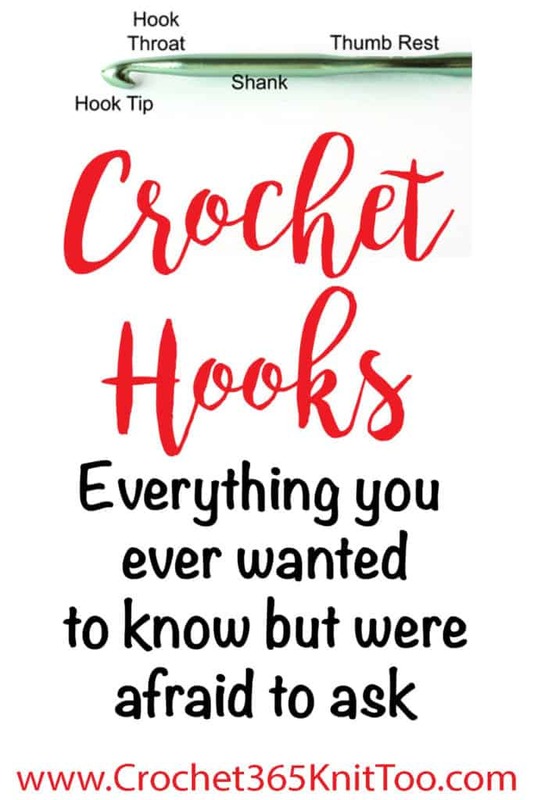 I’m glad you’ve been ‘hooked’ into crochet! It’s my favorite hobby too!